Welcome to the Bakersfield CA Real Estate Market Report – January 2018. The Bakersfield CA single family housing market definitely did not see the seasonal slowdown in the last quarter of 2017 that we normally do for the start of winter season and 2018 is shaping up to be one busy year as well! There was however a fairly flat line with regards to active properties on the market from December 2017 with 972 single family homes on the market in comparison to January 2018’s number of 982 homes on the market for sale. Year over year’s actively listed homes from January 2017 to January 2018 came in with 139 less homes on the market in 2018 from 2017. Newly listed homes in December 2017 was 404 in comparison to January 2018’s number of 706. 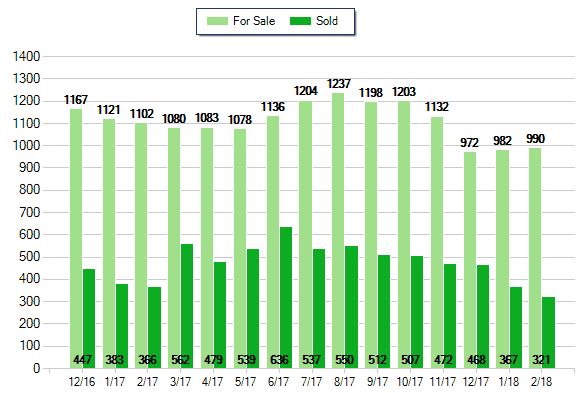 Now, on to sold properties… An interesting trend that we continue to see in Bakersfield CA is the December sold’s versus the January sold properties. For the past two years, December has sold more properties than January which is quite surprising considering the seasonal chaos. There were 367 sold properties in January 2018 which is down from December’s 2017 sold properties of 468. Year over year sold sales are also slightly down with December 2016 having 447 sold properties and January 2017 coming in at 383 sold. Generally in December and January most people aren’t concentrating on buying a home unless their job is relocating or some type of familial change occurs. With that being said, in these two months it’s usually a buyers market so if you’re looking for deals and don’t mind adding buying a home to your task list during the holidays then go for it! Otherwise, relax with your family and when it starts getting warm out then begin your home search. As we look forward to warmer weather in spring be prepared for the real estate market to take off again and this year i’m sure will be no different. March and April consistently come in with the most newly listed properties hitting the market so if you’re looking for that dream home, get ready as we’re only a couple months away! The average sales price in Bakersfield CA for January 2018 was $224,000 in comparison to December 2017 that came in at $257,000. One good thing about these prices is that they are both well under the FHA loan limits for Kern County of $294,515 which means good news for many first time buyers! If you’re thinking about buying a home then you’re in a good spot, contact us anytime and we can assist you through the home buying process. Buyers won’t want to procrastinate though as the average days on market for homes is only 42 days and as we go into the busy season that number will likely diminish. If you’d like to learn more about buying or selling your home or have any additional questions regarding the Bakersfield CA Real Estate Market Report – January 2018 please contact us anytime or feel free to post a comment below!